I had to share this story from “Ms. I,” a K-12 Lead Technology Teacher for students with dyslexia and autism. She uses her dual license in art and technology, and IT field experience, to teach programming, video production, and 3D animation. 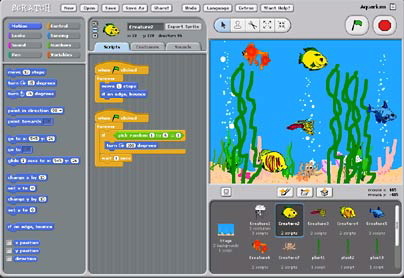 Since 2008, I’ve taught with Scratch, a free application that lets students create computer games. It’s been a great way to promote creativity, collaboration, and critical thinking. My school, however, thought I was “crazy” to teach programming to students with learning disabilities. I forged ahead because I wanted my students to go beyond their limitations and discover their strengths. My greatest success story was John, a 12th grader. During first period, I presented the Scratch project and, as usual, helped John start it. I often couldn’t tell what he was thinking because he generally didn’t display emotion. He would tell me, “I can’t do this,” at the beginning of every class project. This time, rather than asking for help every five seconds, he worked independently. Some weeks later, he pulled me aside to proudly show me his animation. He also stopped complaining for the rest of the year. I was amazed. John is dyslexic and on the autism spectrum. His rehearsed speech did not include his thank-you to me; he spoke from the heart. To get any reluctant learner to begin to say “I can” is impressive on its own. Having taught students with autism and dyslexia myself, though, I know the progress John made with the support of “Ms. I” was no easy feat. Teachers, what’s your greatest success story? ← The College Board can’t touch this. I’ve never heard of Scratch. It sounds like an interesting educational tool. Thanks for sharing! Reblogged this on Greenwich Special Needs Support Group.